Last December, Bill Clinton and Morgan Freeman displayed uncharacteristic interest in which part of the world people will play soccer in more than a decade from now. They were the speakers of the United States bid committee for hosting the 2022 FIFA World Cup, along with President Obama who submitted a video clip of his speech. Besides the United States, Australia, South Korea, Japan, and Qatar competed for the bid with passionate supports from each government. The World Cup fans were shocked because Qatar had two major disadvantages. However, The result did not surprise me. When I watched the entire presentation of each nation, I immediately knew that Qatar was the only country that successfully focused on changing its weaknesses into strengths. Take a look at two amazing short clips taken from Qatar’s presentation. First, to convert its strong association with blazing sun, Qatar made a huge effort to establish a ‘cool’ image. In the video we can see several appearances of the ocean, oasis, water taxi, trees and flags streaming in the breeze, and lots of refreshingly light colors in everything. Most important, Qatar promised to construct open-ceiling, fully air-conditioned stadiums for both players and the spectators. Second, Qatar establishes itself as a soccer-loving nation. In the second video, the audience can feel the grim resolution of Qatari soccer players. The smiles of several Qatari people show their hospitality and sincere wish to host the World Cup. Lastly, proposing stunning stadiums that no one has ever imagined manifested Qatar’s readiness, passion, and interest in soccer. After Qatar’s presentation, people were fascinated by its location, culture, infrastructure, stadiums, and love for soccer. Qatar seemed cooool not only in terms of the weather, but also in terms of attraction. Qatar’s brilliant bid presentation not only succeeded in powerfully branding itself to meet the world’s demands within an hour, but also founded a fantastic mainstay of Qatar’s future nation branding for decades. Still, controversy over FIFA’s decision continues. 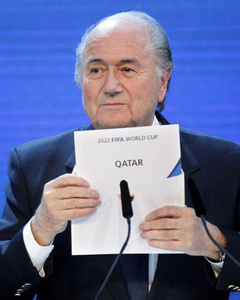 However, as long as FIFA does not change its decision, all we have to do is, as Qatar’s World Cup bid committee’s slogan said, to “Expect Amazing” for the 2022 World Cup.